The apex of the lung extends above the clavicle at its medial end (strenoclavicular joint). The anterior border of lung lies between the 2nd and 4th intercostal spaces and has a cardiac notch on the left side, making room for the heart. 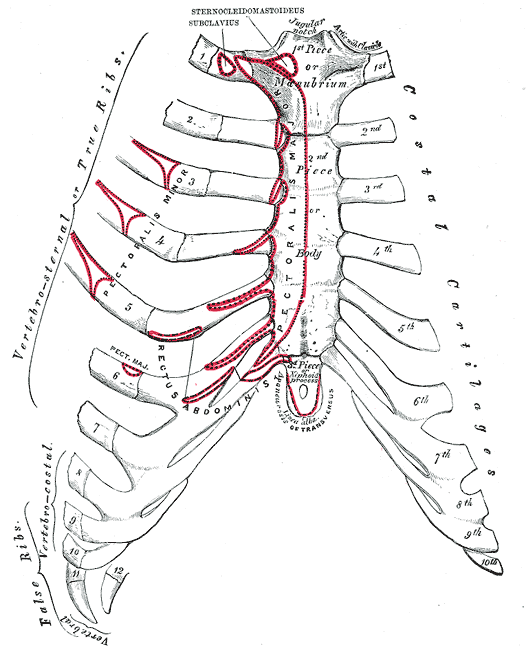 The pleurae extend down to the level of the 12th rib posteriorly, to the 10th rib at the midaxillary line and to the level of the 8th rib at the front. The lungs extend down to a level 2 ribs above the pleurae. The cardiac notch is roughly between the 4th and 6th ribs. Between the pleurae and the lung bases at the bottom is the costodiaphragmatic recess. 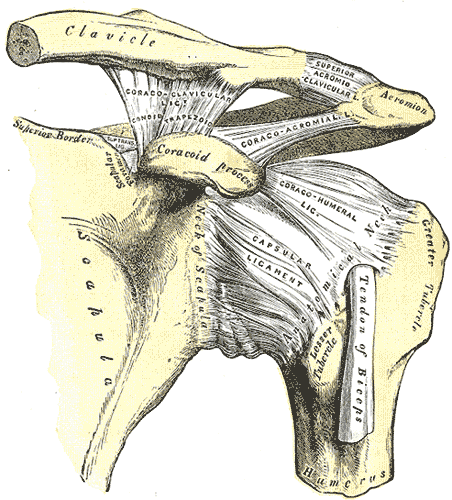 The oblique fissure extends from the level of the spinous process of T2 posteriorly to the 6th costal cartilage anteriorly (roughly the medial border of the scapula). The horizontal fissure of the right lung extends from the oblique fissure along the 4th rib and costal cartilage anteriorly. Inhaled objects pass through the pharynx and into the trachea, becoming lodged into the right lung, because the right bronchus is shorter, wider and vertical than the left. The liver, stomach, spleen, colon, kidney, and peritoneal cavity extend to a higher level than the periphery of the diaphragm and the inferior border of the lung. Hence any perforation of the lower intercostal spaces should be considered an abdominal as well as a thoracic wound. In general, the ribs move around two axes. Movement at costovertebral joints 2 to 6 about a side-to-side axis results in raising and lowering the sternal end of the rib, the "pump-handle" movement. The downward slope of the rib ensures that, in elevation, the sternum moves upward and forward, increasing the anteroposterior diameter of the thorax. Movement at costovertebral joints 7 to 10 about an anteroposterior axis results in raising and lowering the middle of the rib, the "bucket-handle" movement. In elevation, this increases the transverse diameter of the thorax. The costochondral joints are the articulations between the ribs and costal cartilage. They are hyaline cartilagenous joints. Each rib has a depression shaped like a cup that the costal cartilage articulates with. There is normally no movement at these joints. The neurovascular bundle has a strict order: V-A-N, or vein-artery-nerve, from top to bottom. This neurovascular bundle runs high in the intercostal space: therefore, the intercostal space should be penetrated as low as possible by invasive procedures. In reference to the muscles of the thoracic wall, the intercostal nerves and vessels run just behind the internal intercostal muscles: therefore, they are generally covered on the inside by the parietal pleura, except when they are covered by the innermost intercostal muscles, subcostal muscles or the transversus thoracis muscle. A flail chest is a life-threatening medical condition that occurs when a segment of the rib cage breaks under extreme stress and becomes detached from the rest of the chest wall. It occurs when multiple adjacent ribs are broken in multiple places, separating a segment, so a part of the chest wall moves independently. The number of ribs that must be broken varies by differing definitions but is 2-3 ribs broken in 2 or more places. The flail segment moves in the opposite direction as the rest of the chest wall: because of the ambient pressure in comparison to the pressure inside the lungs (it goes in while the rest of the chest is moving out, and vice versa). This so-called "paradoxical motion" can increase the work and pain involved in breathing. Mortality from flail chest is >50% and it is invariably accompanied by pulmonary contusion, a bruise of the lung tissue that can interfere with blood oxygenation. Often, it is the contusion, not the flail segment, that is the main cause of respiratory failure in patients with both injuries. the external intercostal muscles, which aid in quiet and forced inhalation. They originate on ribs 1-11 and have their insertion on ribs 2-12. The external intercostals are responsible for the elevation of the ribs, and expanding the transverse dimensions of the thoracic cavity. the internal intercostal muscles, which aid in forced expiration (quiet expiration is a passive process). They originate on ribs 2-12 and have their insertions on ribs 1-11. The internal intercostals are responsible for the depression of the ribs decreasing the transverse dimensions of the thoracic cavity. the innermost intercostal muscle, the deep layers of the internal intercostal muscles which are separated from them by the neurovascular bundle. Both the external and internal muscles are innervated by the intercostal nerves (the ventral rami of thoracic spinal nerves), and are provided by the intercostal arteries and intercostal veins. Their fibers run in opposite directions. actions - acting alone, tilts head to its own side and rotates it so the face is turned towards the opposite side. Acting together, flexes the neck, raises the sternum and assists in forced inspiration. actions - clavicular head: flexes the humerus; sternocostal head: extends the humerus. As a whole, adducts and medially rotates the humerus. It also draws the scapula anteriorly and inferiorly. actions - protracts and stabilizes scapula, assists in upward rotation. Coarctation of the aorta, or aortic coarctation, is a congenital condition whereby the aorta narrows in the area where the ductus arteriosus (ligamentum arteriosum after regression) inserts. The intercostal arteries provide collateral blood flow to circumvent the stenotic aortic segment. However, the first two intercostal arteries are supplied by the costocervical trunk rather than the descending aorta below the level of coartation. Therefore, the first two intercostal arteries are not collateral pathways and so ribs one and two do not show notching. Rib notching implies long-standing obstruction and is not seen before age 10. The thoracic inlet is essentially a hole surrounded by a bony ring, through which several vital structures pass. The superior thoracic aperture is bounded by: the first thoracic vertebra (T1) posteriorly, the first pair of ribs laterally (more specifically, the first ribs form lateral C-shaped curves posterior to anterior), the costal cartilage of the first rib and the superior border of the manubrium anteriorly. Structures passing through the thoracic inlet: trachea, oesophagus, thoracic duct, apexes of the lungs, nerves, phrenic nerve, vagus nerve, recurrent laryngeal nerves, sympathetic trunks, left and right common carotid arteries, left and right subclavian arteries, internal jugular veins, brachiocephalic veins, subclavian veins, lymph nodes and lymphatic vessels. The muscular fibres of the diaphragm arise from the xiphoid process anteriorly, the costal cartilages 7-12 laterally and posteriorly from the lumbar vertebrae by the crura and the arcuate ligaments. The diaphragm is primarily innervated by the phrenic nerve which is formed from the cervical nerves C3, C4, and C5 ("C-3, 4, 5 keep the diaphragm alive"). The peripheral portions of the diaphragm send sensory afferents via the intercostal (T5-T11) and subcostal nerves (T12). The nerves spread out on the undersurface of the diaphragm. Irritation of the diaphragmatic pleura or diaphragmatic peritoneum is referred to the C4 dermatome with pain over the shoulder. The two lungs and their pleural sacs are situated in the thoracic cavity. The pleura is a thin, glistening, slippery serous membrane, inflammation of which is called pleurisy. The pleura lines the thoracic wall and diaphragm, where it is known as the parietal pleura. It is reflected onto the lung, where it is called the visceral pleura. The visceral pleura covers the lung and dips into its fissures. The facing surfaces of the parietal and visceral pleurae slide smoothly against each other during respiration. The contact between the parietal and visceral pleurae depends on the atmospheric pressure (1) on the outside of the chest wall and (2) inside the alveoli (which are connected to the exterior by the bronchial tree). On the other hand, the two pleural layers tend to be separated by the elasticity of (1) the thoracic wall (directed outward) and (2) the lungs (stretched by inspiration). The pleural cavity, which is the potential space between the two layers, contains only a thin film of fluid. Air in the pleural cavity (pneumothorax) results in collapse of the lung. The pleura is supplied by adjacent arteries and nerves and has numerous lymphatics. Irritation of the parietal pleura causes pain referred to the thoraco-abdominal wall (intercostal nerves) or to the shoulder (phrenic nerve). The lungs are innervated by the pulmonary plexus, consisting of direct branches from the sympathetic chain and pulmonary branches of the vagus nerve. Sympathetic stimulation dilates the bronchioles. Asthma is caused by contraction of smooth muscles, narrowing the bronchioles. Treatment involves inhalation of bronchodilating drugs that mimic sympathetic stimulation. Pleural effusion is excess fluid that accumulates between the two pleural layers, the fluid-filled space that surrounds the lungs. Excessive amounts of such fluid can impair breathing by limiting the expansion of the lungs during ventilation. Four types of fluids can accumulate in the pleural space: a) serous fluid (hydrothorax), b) blood (haemothorax), c) chyle (chylothorax), d) pus (pyothorax or empyema). Once accumulated fluid is more than 300 ml, there are usually detectable clinical signs in the patient, such as decreased movement of the chest on the affected side, stony dullness to percussion over the fluid, diminished breath sounds on the affected side, decreased vocal resonance and fremitus. A pleural effusion will show up as an area of whiteness on a standard posteroanterior X-ray. Pneumothorax is an abnormal collection of air or gas in the pleural space that separates the lung from the chest wall, and that may interfere with normal breathing. Chest pain and sometimes mild breathlessness are the usual predominant presenting features in simple pneumothorax. Breath sounds may be diminished on the affected side, partly because air in the pleural space dampens the transmission of sound. Measures of the conduction of vocal vibrations to the surface of the chest may be altered - percussion of the chest may be perceived as hyperresonant and vocal resonance and tactile fremitus can both be noticeably decreased. Importantly, the volume of the pneumothorax can show limited correlation with the intensity of the symptoms and there may be no apparent physical signs if the pneumothorax is relatively small. Tension pneumothorax is generally considered to be present when a pneumothorax leads to significant impairment of respiration or blood circulation. The most common findings in people with tension pneumothorax are chest pain and respiratory distress, often with an increased heart rate (tachycardia) and rapid breathing (tachypnea) in the initial stages. Other findings may include quieter breath sounds on one side of the chest, low oxygen levels and blood pressure, and displacement of the trachea away from the affected side. Rarely, there may be cyanosis (bluish discoloration of the skin due to low oxygen levels), altered level of consciousness, a hyperresonant percussion note on examination of the affected side with hyperexpansion and decreased movement, pain in the epigastrium (upper abdomen), displacement of the apex beat (heart impulse), and resonant sound when tapping the sternum. This is a medical emergency and may require immediate treatment without further investigations (see below). Tension pneumothorax may also occur in those receiving mechanical ventilation, in which case it may be difficult to spot as the person is typically sedated; it is often noted because of a sudden deterioration in condition. Deviation of the trachea (windpipe) to one side and the presence of raised jugular venous pressure (distended neck veins) are not reliable as clinical signs. The trachea begins below the cricoid cartilage of the larynx at C6, closely related to the thyroid gland and oesophagus. It divides at the carina behind the sternal angle. There are five lobar bronchi, three on the right and two on the left. The segmental bronchi, 10 on the right and 9 on the left, supply wedge-shaped bronchopulmonary segments. These lie with their bases on the visceral pleura and with the apices pointing towards the lung hilum (root). Each segment has its own bronchus, artery, vein and lymphatics and is divided from adjacent segments by connective tissue. The apical and lower segments of the posterior lobes are the sites where fluid is likely to accumulate in patients lying on their backs and is a common site of infection in bedridden patients. The right lung is divided into upper, middle, and lower lobes by an oblique and a horizontal fissure. The left lung is divided into upper and lower lobes by an oblique fissure. The oblique fissure follows approximately the line of rib 6 as far as the inferior border of the lung. When the arm is abducted and the hand placed on the back of the head, the medial border of the scapula indicates approximately the oblique fissure. The horizontal fissure begins at the oblique fissure near the midaxillary line (of the right side), at about the level of rib 6. It extends forward to the anterior border at the level of costal cartilage 4. It may be incomplete or even absent. Blood to be oxygenated is carried by the pulmonary arteries, whereas the tissue of the bronchial tree and alveoli is nourished by the bronchial arteries. The branches of the pulmonary arteries within the lungs accompany the bronchi and end in capillary networks in the alveoli. The arteries at the hilus are visible radiographically and form a pattern that extends into the lung. The pulmonary veins collect oxygenated blood from the lung and deoxygenated blood from the bronchi and visceral pleura and are intersegmental in location. Usually four pulmonary veins enter the left atrium. Bronchial arteries, usually one on the right and two on the left, arise commonly from the aorta. They supply oxygenated blood to the non-respiratory tissues of the lungs, including the visceral pleura. Bronchial veins carry deoxygenated blood from the first few bronchial divisions to the azygos system. Lymph drains from the lung from small-scale pulmonary nodes to the bronchopulmonary nodes at the hilum (the hilar nodes). These drain to a large group of tracheobronchial nodes lying at the bifurcation of the trachea. From here, lymph is carried to the bronchomediastinal lymph trunks which usually empty directly into the subclavian or internal jugular veins. The anterior and posterior pulmonary plexuses around the root of the lung are formed by branches of the vagus and sympathetic trunks. Parasympathetic fibers (of vagal origin) supply the smooth muscle and glands of the bronchial tree. Spasm of the bronchial musculature occurs in asthma and can be relieved by epinephrine. Sympathetic fibers supply blood vessels and probably relax bronchial smooth muscle. Afferent fibers (vagal) from the visceral pleura and bronchi are concerned with the reflex control of respiration. Irritation of endings in the bronchial mucosa provokes coughing. The phrenic nerves supply the mediastinal side of the lungs and central part of the diaphragmatic surface. Pain is referred to C3-C5 dermatomes, over the base of the neck and shoulder. Intercostal nerves supply the costal surface of the lungs and peripheral regions of the diaphragmatic surface. Pain is referred to the area of the skin innervated by the respective nerve. The airways receive parasympathetic input. They receive almost no sympathetic innervations. Pain fibres are present on parietal pleura but not on visceral pleura. The respiratory tract is covered in an epithelium, the type of which varies down the tract. There are glands and mucus produced by goblet cells in parts, as well as smooth muscle, elastin or cartilage. Three distinct types of tissue can be identified: respiratory epithelium, allowing carriage of air to the alveoli and removing debris; alveolar cells, adapted to ensure the alveoli are open and capable of gas exchange; and connective tissue, which supports the rest of the ventilation apparatus. Ciliated epithelial cells are the most prominent type; they are interspersed with secretory cells with release mucus and other substances that protect the airways. The epithelial cells provide a physical barrier to the movement of mucus and anything caught in it (they are classified as pseudostratified columnar epithelium). Goblet cells secrete mucus droplets which serves to catch debris and clear it via the mucociliary escalator. Clara cells produce surfactant and detoxifying enzymes. They are also the stem cells that replicate and differentiate to replace cells lost through damage. Brush cells have microvilli on their apical surfaces and are innervated, suggesting a sensory role. Neuroendocrine cells secrete regulatory factors. Inhaled particles are trapped by mucus and moved out of the respiratory tract by the beating of the cilia on the epithelium. This mucociliary escalator draws mucus to the epiglottis, where it is swallowed. The basement membrane of the capillaries and pneumocytes contains collagen and elastin fibres to provide recoil for expulsion of air from the alveoli during expiration. The basement membrane is thin, to facilitate diffusion. Pulmonary surfactant is a surface-active lipoprotein complex (phospholipoprotein) formed by type II alveolar cells. The proteins and lipids that comprise the surfactant have both a hydrophilic region and a hydrophobic region. By adsorbing to the air-water interface of alveoli with the hydrophilic head groups in the water and the hydrophobic tails facing towards the air, the main lipid component of surfactant, dipalmitoylphosphatidylcholine (DPPC), reduces surface tension and therefore the work of breathing. Alveolar capillaries form a plexus of thin vessels around the alveoli to minimise the diffusion distance. They are continuous and do not feature fenestrations, to prevent fluid from leaving the capillaries due to Starling forces. Alveolar macrophages do not contribute to the diffusion surface but help to clear debris and pathogens; they are derived from circulating macrophages and can travel between alveoli through alveolar wall pores. The airways contain connective tissue that supports and maintains the airways as conduits to the alveoli. Cartilage reinforces the large bronchioles of the respiratory tree, in particular during expiration when the increased pressure can cause collapse (and therefore prevent further expulsion). In large bronchioles and the trachea, cartilage is in the form of rings; as the bronchioles become narrower, cartilage takes the form of small plates before disappearing. Smooth muscle cells are found throughout the respiratory tree and receive autonomic innervation allowing regulation of airway size and resistance. Elastic connective tissue contributes to lung recoil during expiration and inspiration. Smoking changes gene expression in bronchial epithelial cells, decreasing their resistance to ROS and infections. Emphysema is the destruction of the alveolar walls, decreasing the available surface for gas exchange. Inhaled pollutants from smoking and atmospheric pollution damage the alveoli and cause emphysema, which decreases the surface area available for gas exchange and lung compliance. It is a major cause of death. Total ventilation: volume breathed out per minute = breath volume x respiratory rate. Respiratory dead space: air that is inhaled by the body in breathing, but does not take part in gas exchange. Not all the air in each breath is able to be used for the exchange of oxygen and carbon dioxide. About a third of every resting breath has no change in O2 and CO2 levels. In adults, it is usually in the range of 150 mL. Alveolar ventilation: the volume of gas per unit time that reaches the alveoli, the respiratory portions of the lungs where gas exchange occurs = (tidal volume - dead space) x respiratory rate. Pulmonary compliance (or lung compliance) can refer to either dynamic or static lung compliance. Static lung compliance is the change in volume for any given applied pressure. Dynamic lung compliance is the compliance of the lung at any given time during actual movement of air. Compliance is greatest at moderate lung volumes, and much lower at volumes which are very low or very high. It is estimated a change in volume over change in pleural pressure. Work of breathing is the product of the volume change and total change in pressure. Vital capacity is the maximum volume of air than can be inhaled and exhaled by the lungs. Tidal volume is the lung volume representing the normal volume of air displaced between normal inspiration and expiration when extra effort is not applied. Typical values are around 500ml or 7ml/kg bodyweight. Functional residual capacity is the volume of gas in the lungs at the end of a normal breath. Residual volume is the volume remaining after maximal expiration. Intrapleural pressure is negative. Pneumothorax is an abnormal collection of air or gas in the pleural space that separates the lung from the chest wall, and that may interfere with normal breathing. A primary pneumothorax is one that occurs without an apparent cause and in the absence of significant lung disease, while a secondary pneumothorax occurs in the presence of pre-existing lung pathology. Occasionally, the amount of air in the chest increases markedly when a one-way valve is formed by an area of damaged tissue, leading to a tension pneumothorax. This condition is a medical emergency that can cause steadily worsening oxygen shortage and low blood pressure. Compliance of the lungs is measured as the change in volume of the lungs for a change in pressure and is a measure of how easily the lungs can be inflated. The interaction with the pleura means that the compliance of the lungs and chest wall are slightly different. Surface tension is a property of the surface of a liquid that allows it to resist an external force. The lungs are compliant during normal breathing and becomes less so at large and small volumes. Low compliance indicates a stiff lung and means extra work is required to bring in a normal volume of air. This occurs as the lungs in this case become fibrotic, lose their distensibility and become stiffer. In a highly compliant lung, as in emphysema, the elastic tissue has been damaged, usually due to their being overstretched by chronic overinflation. Patients with emphysema have a very high lung compliance due to the poor elastic recoil, they have no problem inflating the lungs but have extreme difficulty exhaling air. Lung surfactant decreases surface tension and so increases compliance. Failure of production (as in preterm infants) leads to Infant Respiratory Distress Syndrome (IRDS). Treatment is glucocorticoids, e.g. cortisol for the mother before delivery and oxygen to the infant after delivery. constitutive or basal secretion: low level, unregulated and essentially continuous secretion. This pathway is dependent on cytoskeletal movement of secretory granules. Mucus outflow (both volume and viscidity) is under autonomic control. Hypersecretion of mucus may be chronic, but increased volumes are produced in exacerbations of chronic obstructive pulmonary disease (COPD), during attacks of asthma, and in bronchiectatic and cystic fibrosis patients with chronic bacterial colonization. In cystic fibrosis, chronic airway obstruction caused by viscous secretions (due to chloride pump failure) is followed by progressive pulmonary colonization with pathogenic bacteria, including Haemophilus influenzae, Staphylococcus aureus, and eventually P. aeruginosa and/or Burkholderia cepacia complex bacteria. Airflow is turbulent in the trachea, in transition in most of the respiratory tree and laminar in the small bronchioles. Airways resistance is determined by cross-sectional area. Maximal resistance is encountered in the first seven generations of airway branching after which point the total cross-sectional area increases. The lung volume alters the support that the connective tissue fibres provide to the lung, drawing open the airways. Airway smooth muscle tone can be altered autonomically. Airway resistance is measured using the "forced expiratory volume in one second", FEV1 and peak expiratory flow (PEF - maximum speed of expiration), the latter being relatively constant regardless of the force of expiration. In restrictive disease (e.g. fibrosis), the ability of the lung to expand is impeded and FVC is reduced while FEV1 is relatively normal because the airways are not obstructed. Obstructive disease (asthma, bronchiectasis, bronchitis and COPD) leads to the obstruction of airflow through the lungs. The FEV1 is reduced while the FVC is relatively normal. FEV1/FVC is the ratio of FEV1 to FVC. In healthy adults this should be approximately 75–80%. In obstructive diseases (asthma, COPD, chronic bronchitis, emphysema), FEV1 is diminished because of increased airway resistance to expiratory flow; the FVC may be decreased as well, due to the premature closure of airway in expiration but not in the same proportion as FEV1. This generates a reduced value (<80%, often ~45%). In restrictive diseases (such as pulmonary fibrosis) FEV1 and FVC are both reduced roughly proportionally and the FEV1/FVC value may be normal. Diffusing capacity is a long established measurement of the lung's ability to transfer gases between the air and the blood. dV(O2)/dt is the rate that oxygen is taken up by the lung (ml/min). Palveoli(O2) is the partial pressure of oxygen in the alveoli. Ppulmonary artery(O2) is the partial pressure of oxygen in the pulmonary artery. Factors influencing the speed of diffusion include the gradient of the concentrations at the surface, the solubility of oxygen and the surface area of the diffusing surface. The latter is physiologically the most relevant and emphysema, oedema and pulmonary fibrosis all severely impede the diffusion capacity and therefore oxygen uptake. Oxygen solubility is low, hence the need for haemoglobin (active carriage) to ensure adequate supply. A small amount of oxygen is dissolved in fluid. At the normal P(O2) = 100 mmHg (13.3 kPa), there is around 0.3 mL O2 / 100 mL of blood (insufficient for the needs of the body). Haemoglobin has four chains (two alpha, two beta), each of which is attached to a haem group, which is the site of oxygen binding. O2 binds reversibly to Fe2+ ions carried by each haem group to form oxyhaemoglobin. There are typically four copies of the alpha chain gene and two copies of the beta chain gene. Alpha and beta chains are found in the adult (HbA) and gamma chains replace beta chains in fetal haemoglobin. Adult HbA makes up 98% of total haemoglobin while in the fetus the predominant type is HbF (two alpha and two gamma chains. HbF is not regulated by 2,3-diphosphoglycerate (2,3-DPG), which allows it to bind oxygen at higher affinity than HbA. Oxygen dissociation is promoted by temperature increase, increased acidity (e.g. due to anaerobic respiration producing lactic acid or CO2 concentration increase producing carbonic acid) and the action of 2,3-DPG (thyroxine, adrenaline and HGH all promote 2,3-DPG production in response to increased metabolic need). Normal systemic arterial P(CO2) is 40 mmHg or 5.3 kPa (same as P(O2) in venous blood). CO2 is 20x more soluble than oxygen but only a small proportion of CO2 transport is medicated directly by dissolving in solution. Three mechanism contribute to the bulk of the transport: bicarbonate-mediated transport, carbamino-mediated transport and dissolution. Bicarbonate can diffuse out of cells but H+ cannot cross the membrane so Cl- transport into the cell is necessary to maintain charge neutrality across the membrane. As carbonic acid is constantly removed from the cell, the this allows its continuous production from water and carbon dioxide. In venous blood, more CO2 is present and therefore more intracellular Cl- is found. This "chloride shift" causes osmotically driven movement of water into the cells, so that both RCV and haematocrit are raised in venous blood. 30% of carbon dioxide transport is carried out by carbamino groups. The N-terminus of proteins contains a free NH2 group, which can combine with CO2 to produce a carbamino group. This reaction is readily reversible, releasing CO2 if the P(CO2) falls. Most carbamino groups are found on the peptide chains of haemoglobin. Deoxygenated haemoglobin has a higher capacity for forming carbamino groups than oxygenated haemoglobin. 10% of CO2 transport is transported dissolved in blood. The dissolved amount is proportional, as always, to the partial pressure of the solution. The CO2 dissociation curve is more linear than the O2 dissociation curve and there is no saturation. It is steeper because the solubility of CO2 is higher and the physiological range is narrower: 5.3 - 6 kPa (arteries to veins) compared with 5.3 - 13.3 kPa for oxygen (veins to arteries). Haemoglobin reduced through unloading O2 more readily accepts H+ ions produced from carbonic acid, which promotes the formation of bicarbonate in low oxygen conditions. 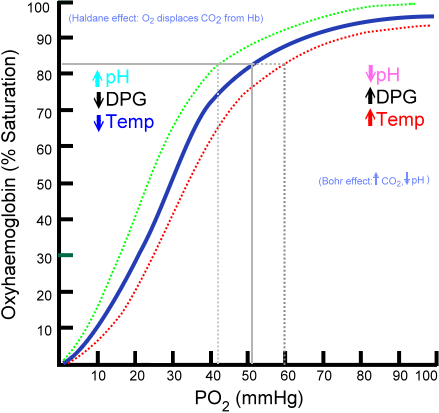 Conversely, in oxygenated blood, the ability of haemoglobin to bind H+ is reduced, so in the lung the unloading of CO2 from blood is promoted (the Haldane effect). In tissues after Hb has released O2 it has an increased ability to pick up CO2 and in the lung, as hemoglobin binds to O2 the Hb more readily releases CO2. In patients with lung disease, the lungs may not be able to increase alveolar ventilation in the face of increased amounts of dissolved CO2. This partially explains the observation that some patients with emphysema might have an increase in PaCO2 (partial pressure of arterial dissolved carbon dioxide) following administration of supplemental oxygen even if content of CO2 is unchanged. The pulmonary circulation is the low-pressure circulation pumped by the right side of the heart. It carries deoxygenated blood to the lungs for gas exchange; the blood then flows into the tributaries of the pulmonary veins which return the oxygenated blood to the heart for distribution to the systemic circulation. Pulmonary systolic pressure is 25 mmHg and diastolic pressure is 8 mmHg (a large variation per heartbeat). The low pressure is due to the large volume pumped (same as the systemic volume pumped) but the shorter distance and therefore lower resistance. The low pressure is reflected in the much thinner walls of the pulmonary vessels. An increase in pressure inside the pulmonary capillaries results in increased fluid leaving the capillaries, leading to pulmonary oedema, which can damage the alveoli. It is treated by reducing blood pressure in the lung, best achieved by improving cardiac function while giving oxygen. The ventilation-perfusion ratio is defined as the ratio of the amount of air reaching the alveoli to the amount of blood reaching the alveoli. It varies across the lung but averages around 0.8 (higher in the apex and lower in the base, mainly due to gravity). A pulmonary shunt is a physiological condition which results when the alveoli of the lung are perfused with blood as normal, but ventilation (the supply of air) fails to supply the perfused region. A pulmonary shunt often occurs when the alveoli fill with fluid, causing parts of the lung to be unventilated although they are still perfused. Intrapulmonary shunting is the main cause of hypoxemia (inadequate blood oxygen) in pulmonary edema and conditions such as pneumonia in which the lungs become consolidated. Physiological shunt is rarely over 4%; in pathological conditions such as pulmonary contusion, the shunt fraction is significantly greater and even breathing 100% oxygen does not fully oxygenate the blood. The top of the lungs is well ventilated but more poorly perfused, with V/Q approximately around 3. The base of the lungs are better perfused due to gravity but less ventilated and V/Q is around 0.5. Overall mismatch across the lungs prevents adequate transport of O2 into the blood and restricts CO2 removal, leading to acidosis and hypoxia. A lower V/Q ratio (with respect to the expected value for a particular lung area in a defined position) impairs pulmonary gas exchange and is a cause of low arterial partial pressure of oxygen (paO2). Excretion of carbon dioxide is also impaired but a rise in arterial partial pressure of carbon dioxide (paCO2) is very uncommon because this leads to respiratory stimulation and the resultant increase in alveolar ventilation returns paCO2 to within the normal range. These abnormal phenomena are usually seen in chronic bronchitis, asthma and acute pulmonary edema. A high V/Q ratio increases paO2 and decreases paCO2. This finding is typically associated with pulmonary embolism (where blood circulation is impaired by an embolus). Ventilation is wasted, as it fails to oxygenate any blood. A high V/Q can also be observed in COPD as a maladaptive ventilatory overwork of the undamaged lung parenchyma. The pressure in the pulmonary circulation must be kept low but there is vasoconstriction in hypoxia. Regions of low alveolar oxygen trigger vasoconstriction of the arterioles around them, probably to ensure that pulmonary blood flows to well-ventilated areas and diverting it away from blocked or compressed airways. At high altitude, a widespread vasoconstriction in the lungs can occur, which increases pulmonary pressure and can cause pulmonary oedema. The central chemoceptors are located on the surface of the medulla, near the exit of the cranial nerves IX and X. They detect changes in the pH of cerebrospinal fluid. Because CO2 diffuses freely across the blood-brain barrier where it combines with water to generate acid, this is a measure of the CO2 level outside the CSF. This system is thought to control 80% of breathing response. Adaptation to chronic acidosis by central chemoceptors is important in disease. Hypoventilation in COPD involves multiple mechanisms, including decreased responsiveness to hypoxia and hypercapnia, increased ventilation-perfusion mismatch leading to increased dead space ventilation, and decreased diaphragm function secondary to fatigue and hyperinflation. Chronic respiratory acidosis also may be secondary to obesity hypoventilation syndrome (i.e., Pickwickian syndrome), neuromuscular disorders such as amyotrophic lateral sclerosis, and severe restrictive ventilatory defects as observed in interstitial fibrosis and thoracic deformities. Peripheral chemoceptors are located in the aortic arch and carotid bodies at the bifurcation of the common carotids. The carotid bodies contribute more than the aortic chemoceptors. These peripheral receptors together respond to O2 as well as pH and CO2 changes and can respond on a time-scale shorter than one breath. Carotid bodies respond to arterial pH changes while the aortic receptors cannot. Because carbon dioxide is the main regulator of ventilation through the medullary chemoceptors, arterial oxygen must fall significantly (to <60 mmHg) for the peripheral sensors to respond significantly. Hypoxaemia is detected by type I cells in the peripheral chemoceptor. Pulmonary stretch receptors in smooth muscle of the airways sense distension of the airways and signal via the vagus nerves, triggering the Hering-Breuer reflex, which regulates the lung volume to prevent over-inflation: if lung volume is larger than normal, breathing slows down while if the lungs are excessively deflated, the next breath is larger. This reflex is mainly important in infancy. Irritant receptors are located in the walls of the airways and sense dust, smoke, cold air etc. The impulses are sent through the vagus nerve and trigger bronchoconstriction to reduce the amount of irritant reaching the base of the lungs. Increased breathing aids the removal of the irritant. These receptors adapt quickly to chemical and mechanical stimuli, e.g. the presence of a foreign body in the airways. J receptors respond to changes in blood composition and trigger shallow breathing. They are probably triggered by increased alveolar fluid volume and may contribute to the shallow breathing seen in left heart failure and interstitial lung disease. C fibres are found in connective tissues of the lungs and detect mechanical distortion of tissue to to irritants, oedema, etc. Activation of the fibres results in rapid hyperventilation, increased mucus secretion and bronchoconstriction (attempts to remove the irritant). The cough receptors, or rapidly adapting irritant receptors are located mainly on the posterior wall of the trachea, pharynx, and at the main carina, the point where the trachea branches into the main bronchi. The receptors are less abundant in the distal airways, and absent beyond the respiratory bronchioles. When triggered, impulses travel via the internal laryngeal nerve, a branch of the superior laryngeal nerve which stems from the vagus nerve (CN X), to the medulla of the brain. This is the afferent neural pathway. Unlike other areas responsible for involuntary actions like swallowing, there is no clearly identifiable area that can be labeled as the cough center in the brain. stimulation of the auricular branch of the vagus nerve supplying the ear may also elicit a cough (Arnold's reflex). Respiratory muscle weakness, tracheostomy, or vocal cord pathology (including paralysis or anesthesia) may prevent effective clearing of the airways. The reflex is impaired if the abdominal and respiratory muscles are weak. This can be caused by muscle weakness or paralysis, prolonged inactivity or surgery involving these muscles. Bed rest interferes with the expansion of the chest and limits the amount of air that can be taken into the lungs in preparation for coughing, making the cough weak and ineffective. This reflex may also be impaired by damage to the internal branch of the superior laryngeal nerve, which relays the afferent branch of the reflex arc. This nerve is most commonly damaged by swallowing a foreign object, such as a chicken bone, resulting in it being lodged in the piriform recess (in the laryngopharynx) or by surgical removal of an object. Medications against asthma aim to reduce inflammation prophylactically and in acute attacks to rapidly bronchodilate. Glucocorticoids, e.g. cortisol, up-regulate the expression of anti-inflammatory proteins and down-regulate the expression of proinflammatory proteins. Leukotriene inhibitors reduce the level of leukotrienes, which are fatty compounds produced by the immune system that cause inflammation in asthma and bronchitis, and constrict airways (montelukast, zafirlukast and zileuton). They are less effective than corticosteroids and thus less preferred in the treatment of asthma. Beta-agonists, e.g. salbutamol, salmeterol act on the beta2-adrenergic receptor thereby causing smooth muscle relaxation, resulting in dilation of bronchial passages, vasodilation in muscle and liver, relaxation of uterine muscle, and release of insulin. They are therefore used in atomised form for acute attacks. Side-effects of insomnia, anxiety, increased heart rate and tremor occur in some patients. Methylxanthines (theophylline, aminophylline) are a group of stimulant alkaloids commonly used for their effects as mild stimulants and as bronchodilators, notably in treating the symptoms of asthma (mainly as a second line treatment). Methylxanthines affect not only the airways but stimulate heart rate, force of contraction, cardiac arrhythmias at high concentrations. In the CNS they increase alertness, stimulate the respiratory centre, and are used for treatment of infantile apnea. In high doses they can lead to convulsions that are resistant to anticonvulsants. Methylxanthines induce acid and pepsin secretions in the GI tract. Caffeine is in this class. Theophylline is in addition believed to have immunodepressant activity via a separate mechanism. Mast cell stabilizers are cromone medications used to prevent or control certain allergic disorders, including asthma. They block a calcium channel essential for mast cell degranulation, stabilizing the cell and thereby preventing the release of histamine and related mediators. One suspected pharmacodynamic mechanism is the blocking of IgE-regulated calcium channels. Without intracellular calcium, the histamine vesicles cannot fuse to the cell membrane and degranulate. As inhalers, they are used to treat asthma, as nasal sprays to treat hay fever (allergic rhinitis) and as eye drops for allergic conjunctivitis (in oral form they are used to treat the rare condition of mastocytosis). Ipratropium bromide (atrovent, apovent and aerovent) is an anticholinergic drug used for the treatment of chronic obstructive pulmonary disease and acute asthma. It blocks the muscarinic acetylcholine receptors in the smooth muscles of the bronchi in the lungs, opening the bronchi. There are other muscarinic antagonists with similar mechanisms. Antitussives are agents that are effective against cough. Although the cough reflex is useful, suppression of cough for some part of the day may give symptomatic relief to patient and family. Pholcodeine and codeine are effective with a small risk of addiction. Dextromethorphan is neither addictive nor analgesic. Diphenhydramine is a cough suppressant; its antihistamine effect is sedative and decongestive; its anticholinergic effect dries up secretions. Opiates, methadone and diamorphine linctus are powerful cough suppressants with obvious addictive properties. They are potentiated by adding an antihistamine. A dry, hacking cough has been described in 5 to 20 percent of patients treated with an ACE inhibitor. It usually begins within one to two weeks of instituting therapy, but can be delayed up to six months. Women are affected more frequently than men. Chinese, at least in Hong Kong, have a high prevalence that approaches 50 percent. It typically resolves within one to four days of discontinuing therapy, but can take up to four weeks. It generally recurs with rechallenge, either with the same or a different ACE inhibitor. It does not occur more frequently in patients with asthma but it may be accompanied by bronchospasm. The mechanism responsible for the ACE inhibitor-induced cough is not known, but increased local concentrations of kinins, substance P, prostaglandins, or thromboxane are suspected (especially bradykinin). Respiratory stimulants, e.g. doxapram, stimulate chemoreceptors in the carotid bodiesof the carotid arteries, which in turn, stimulates the respiratory centre in the brain stem. Doxapram is used in intensive care settings to stimulate the respiratory rate in patients with respiratory failure. It may be useful for treating respiratory depression in patients who have taken excessive doses of drugs such as buprenorphine which may fail to respond adequately to treatment with naloxone. Salicylates are acidic and change the pH of blood, leading to a compensatory increase in respiratory rate to clear CO2 from lungs more rapidly. Many different CNS depressant drugs such as alcohol, benzodiazepines, barbiturates, GHB, sedatives and opiates produce respiratory depression when taken in large or excessive doses; however this is most commonly seen as a cause of death with opiates or opioids, particularly when they are combined with sedatives such as alcohol or benzodiazepines. Patients with complete upper airway obstruction have no effective air movement, hence no audible speech, cry, or cough. Causes of complete upper airway obstruction include foreign body aspiration, angioedema from anaphylaxis, and epiglottitis. Noisy inspiration (stridor) is a hallmark of severe partial upper airway obstruction although absence of stridor does not preclude significant partial airway obstruction, especially in a patient with depressed mental status. Common causes of severe partial upper airway obstruction include foreign body aspiration, infection (most commonly croup), and injury (such as airway thermal or chemical burns). Compromise of respiratory function can occur as the result of upper or lower respiratory tract processes. The clinical manifestations of respiratory distress depend, in part, on the location of the disease process. As an example, stridor develops in children with upper airway obstruction, whereas rales are characteristic findings of alveolar disease. Pneumonia is a common cause of lower respiratory obstruction. The two main bronchi enter the lung hilum with the pulmonary vessels; the right main bronchus is shorter, wider and more vertical than the left and for these reasons, inhaled objects have a preference for lodging in the right lung. Bronchial carcinomas (primary lung cancers) are carcinomas that derive from epithelial cells. Worldwide, lung cancer is the most common cause of cancer-related death in men and women, and is responsible for 1.3 million deaths annually, as of 2004. The most common symptoms are shortness of breath, coughing (including blood) and weight loss. The non-small-cell lung carcinomas (NSCLC) are grouped together because their prognosis and management are similar. There are three main sub-types: squamous cell lung carcinoma, adenocarcinoma, and large-cell lung carcinoma. Accounting for 25% of lung cancers, squamous cell lung carcinoma usually starts near a central bronchus. A hollow cavity and associated necrosis are commonly found at the center of the tumor. Well-differentiated squamous cell lung cancers often grow more slowly than other cancer types. Adenocarcinoma accounts for 40% of non-small-cell lung cancers and usually originates in peripheral lung tissue. Most cases of adenocarcinoma are associated with smoking; however, among people who have never smoked ("never-smokers"), adenocarcinoma is the most common form of lung cancer. A subtype of adenocarcinoma, the bronchioloalveolar carcinoma, is more common in female never-smokers and responds differently to treatment. LCLC is, in effect, a "diagnosis of exclusion", in that the tumor cells lack light microscopic characteristics that would classify the neoplasm as a small-cell carcinoma, squamous-cell carcinoma, adenocarcinoma, or other more specific histologic type of lung cancer. Small-cell lung carcinoma (SCLC) is less common. Most cases arise in the larger airways (primary and secondary bronchi) and grow rapidly, becoming quite large. The small cells contain dense neurosecretory granules (vesicles containing neuroendocrine hormones), which give this tumor an endocrine/paraneoplastic syndrome association. While initially more sensitive to chemotherapy and radiation, it is often metastatic at presentation, and ultimately carries a worse prognosis. Small-cell lung cancers have long been dichotomously staged into limited and extensive stage disease. This type of lung cancer is strongly associated with smoking. The parietal nodes of the thorax are the parasternal, phrenic, and intercostal. 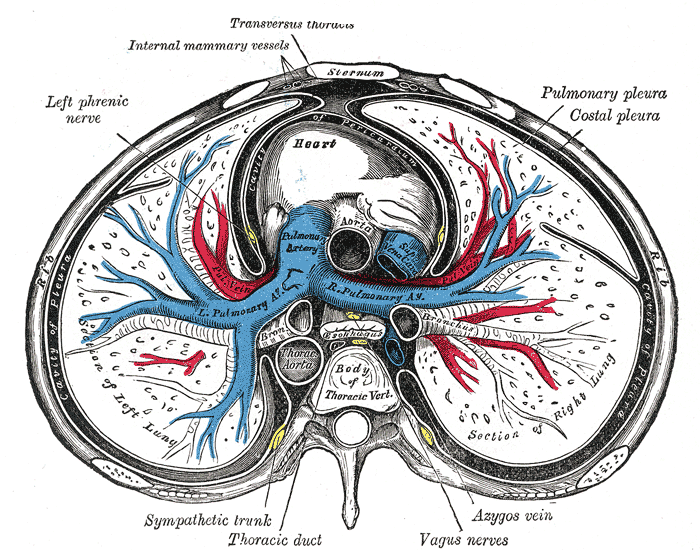 The visceral nodes drain the lungs, pleurae, and mediastinum. The nodes in the roots and hili of the lungs are arranged in several groups: pulmonary along the larger bronchi, bronchopulmonary mainly at the hilus, and tracheobronchial near the bifurcation of the trachea. Lymph nodes in the roots of the lungs tend to be involved secondarily in infections, such as tuberculosis, and in tumors of the lungs and mediastinum. Their density may increase so that they become visible radiographically, especially if they become calcified. Small cell carcinoma is most often more rapidly and widely metastatic than non-small cell lung carcinoma; there is usually early involvement of the hilar and mediastinal lymph nodes. In a significant number of cases, small cell carcinomas can produce ectopic hormones, including adrenocorticotropic hormone (ACTH) and anti-diuretic hormone (ADH). Ectopic production of large amounts of ADH leads to syndrome of inappropriate production of anti-diuretic hormone (SIADH). Lambert-Eaton myasthenic syndrome (LEMS) is a well-known paraneoplastic condition linked to small cell carcinoma. The lungs are constantly exposed to particulate material and microbes that are present in the upper airways and, by microaspiration, enter the lower respiratory tract. Nevertheless, the lower airways usually remain sterile because of the pulmonary defense mechanisms. These host defenses can be categorized as innate (nonspecific) or acquired (specific). The development of community-acquired pneumonia (CAP) indicates either a defect in host defenses, exposure to a particularly virulent microorganism, or an overwhelming inoculum. influenza virus markedly reduces tracheal mucus velocity within hours of onset of infection and for up to 12 weeks postinfection. Streptococcus pneumoniae and Neisseria meningitidis produce proteases that can split secretory IgA. In addition, the pneumococcus produces other virulence factors, including: the capsule that inhibits phagocytosis, pneumolysin, a thiol-activated cytolysin that interacts with cholesterol in host cell membranes, neuraminidase, and hyaluronidase. Mycobacterium spp, Nocardia spp, and Legionella spp are resistant to the microbicidal activity of phagocytes. Predisposing factors include alterations in the level of consciousness, which predispose to both macroaspiration of stomach contents (due to stroke, seizures, drug intoxication, anesthesia, and alcohol abuse) and to microaspiration of upper airway secretions during sleep; tobacco; alcohol, acidosis, toxic inhalations, pulmonary oedema, uremia, old age esp. ≥65 years, cystic fibrosis, bronchiectasis, COPD, lung cancer, bronchial obstruction due to stenosis, tumor, or foreign body. Emphysema is defined by abnormal and permanent enlargement of the airspaces that are distal to the terminal bronchioles. This is accompanied by destruction of the airspace walls, without obvious fibrosis (ie, there is no fibrosis visible to the naked eye). Exclusion of obvious fibrosis was intended to distinguish the alveolar destruction due to emphysema from that due to the interstitial pneumonias. However, many studies have found increased collagen in the lungs of patients with mild COPD, indicating that fibrosis exists. Emphysema can exist in individuals who do not have airflow obstruction; however, it is more common among patients who have moderate or severe airflow obstruction. Bronchiectasis is a disease state defined by localized, irreversible dilation of part of the bronchial tree caused by destruction of the muscle and elastic tissue. It is classified as an obstructive lung disease, along with emphysema, bronchitis, asthma, and cystic fibrosis. Involved bronchi are dilated, inflamed, and easily collapsible, resulting in airflow obstruction and impaired clearance of secretions. Bronchiectasis is associated with a wide range of disorders, but it usually results from bacterial infections, such as infections caused by the Staphylococcus or Klebsiella species or Bordetella pertussis or viral infections, esp. AIDS. The classic clinical manifestations of bronchiectasis are cough and the daily production of mucopurulent and tenacious sputum lasting months to years. Other, less specific complaints include dyspnea, wheezing, and pleuritic chest pain. Side effects of chronic obstructive disease include vulnerability to infection and chronic respiratory acidosis.